According to the archives of Minerva, the case of the present piece was manufactured between 1938 and 1940, and the movement was delivered on September 30, 1939. Few timepieces bear as much aesthetic impact and historical interested as early oversized chronograph wristwatches. Always made for technical purposes - most often as a tool to aid pilots navigate their craft - they were true precision instruments and crafted with the highest production standards. Consequently, these watches nearly always bore details intended to aid the professional on his job such as - in the present watch - the telemeter and tachymeter scale, and the revolving bezel. 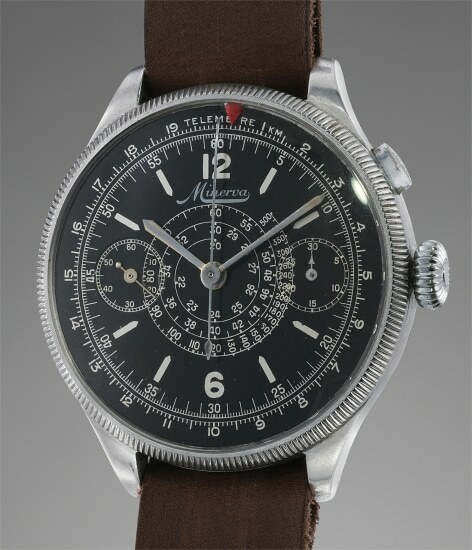 It is not surprising that this kind of pieces were tool watches: in a time (the 1930s and 1940s) when the “standard” measure for a man’s wristwatch was hovering between 31 and 35mm, the gargantuan proportions of these instruments truly relegated them to the professional field where the need for high legibility was indispensable. Nowadays, the trend has evolved, and the few pieces which survived intact until today unite at once the charm of a vintage piece with aesthetics typical of the new millennium. Unfortunately, the professional connotation of these pieces implies that most of them have been heavily used and serviced with the usual consequences: polishing of the case, substitution of components, often a refresh to the dial. Only in very few instances - such as the present one - the watch arrives to us in absolutely superb, unmolested condition, making the present occasion a nearly unique opportunity to own one such watch in absolutely original and extremely well-preserved condition.